Happy Friday, wonderful people! Conferences are over, the Book Fair has closed, and we're heading to a birthday party at a trampoline park this evening. The pictures above were taken by the girls! Little Sis decided to play dress-up on Tuesday. Her sister helped her become a ballerina kitty! Then Big Sis turned her hair into mouse ears and dressed up as a little white mouse. I handed her the camera, showed her how to use the self-timer, and let her borrow my tripod. Ta-da! They took these pictures all by themselves. 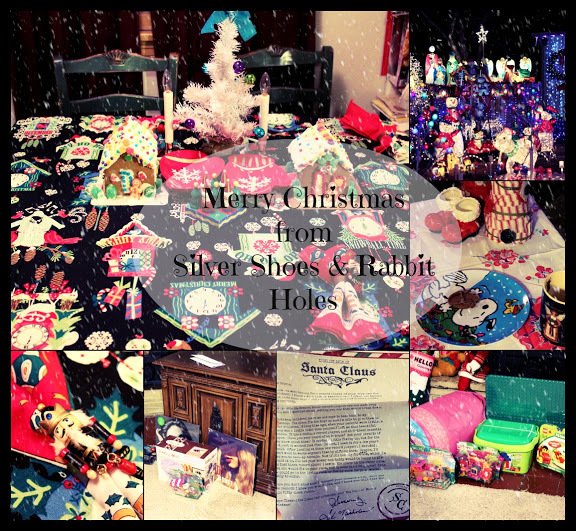 Yes, I totally doctored them up, but aren't they a hoot? Do you see the spoon and fork in Little Kitty's hands? 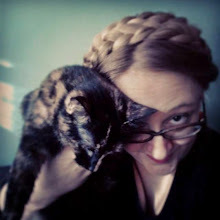 I've already shared a few things we've read this week, and there are other books I'm holding on to for future posts, but here's my list for today. 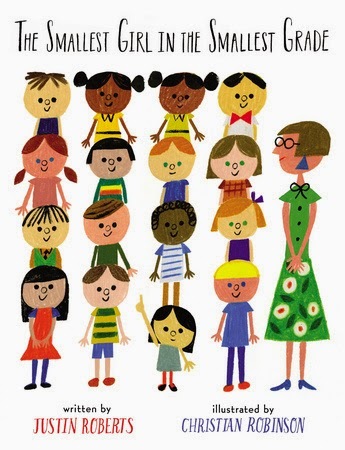 The Smallest Girl in the Smallest Grade by Justin Roberts, illustrated by Christian Robinson. G.P. Putnam's Sons Books for Young Readers, 2014. This one caught Little Sis's eye at the book store, so I reserved it from the library. No wonder it caught her eye: I told you Christian Robinson is becoming one of my favorite illustrators! Justin Roberts is a kids' music icon that we listened to a great deal when the girls were smaller. 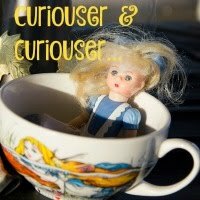 The Smallest Girl in the Smallest Grade is about the tiny girl no one notices, but who notices everything around her, including bullying. The message of the book is that even the smallest person can make a difference if she makes her voice heard. The girls really liked this one. Here's a little bookish-related Justin Roberts for you. Telephone by Mac Barnett, illustrated by Jen Corace. 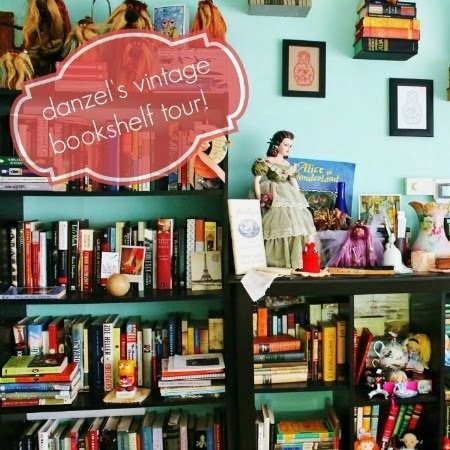 Chronicle Books, 2014. Another one of my favorite illustrators is Jen Corace. 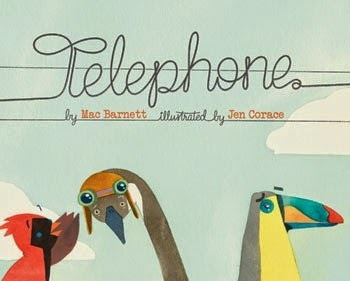 This adorable collaboration with Mac Barnett is about an accidental game of "telephone." A mother bird tells another bird to tell her son, Peter, that it's time for dinner. The message is passed from bird to bird, becoming sillier and sillier each time. You can see more of Jen Corace's illustrations at her website. 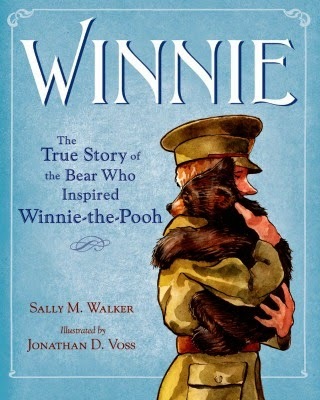 Winnie: The True Story of the Bear Who Inspired Winnie-The-Pooh by Sally M. Walker, illustrated by Jonathan D. Voss. Holt Books for Young Readers, 2015. For someone who has loved Winnie-The-Pooh all her life, I was not familiar with this story at all. 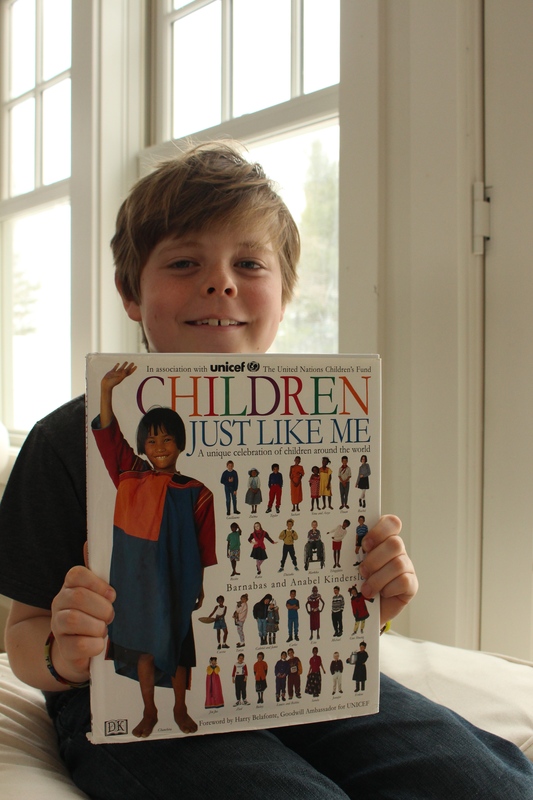 The girls and I adored this picture book, and we highly recommend it. It is the true story of Harry Colebourn, a veterinarian solder-in-training, who buys an orphaned bear cub at a train station. Stationed out of Winnipeg, he names the cub for the town, calling her Winnie, for short. Winnie becomes the unit's mascot, and when they ship out for England, it's accepted that she will come, too. When the time comes for Colebourn to leave for the battlefields of France, he knows he cannot bring his beloved bear. He secures a place for her at the London Zoo, where she quickly becomes the star attraction. 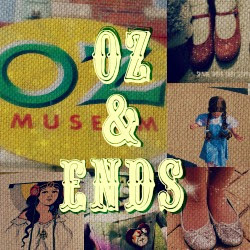 After the war, it's clear to Colebourn that Winnie loves her new home, and he must say goodbye. Winnie was so gentle that she even gave children rides on her back! When little Christopher Robin Milne visited the zoo, he was so taken with Winnie that he renamed Edward, his toy bear, which of course inspired the books and poems by his father, A.A. Milne. Here is a video about Winnie by the London Zoological Society. Owl Diaries, Book One: Eva's Treetop Festival by Rebecca Elliott. Scholastic, 2015. During the fall Scholastic Book Fair, I bought Little Sis another Scholastic "Branches" book, the first title in the Princess Pink and the Land of Fake-Believe series. Little Sis loves being read to, but she doesn't always like reading on her own. She's actually a good reader. Her teacher says she has no trouble at school. The problem, I've discovered, is that when she is at home, she always has to be doing something with her hands! And yes, that usually means drawing. When I read to her, she usually draws away. I think she gets fidgety reading on her own at home. These "Branches" books are great! They are heavily illustrated, with fewer words per page than most early chapter books. She turns pages more often, which keeps her hands busy, and she loves the pictures. We bought this adorable book yesterday, and she zipped through the first five chapters! She read it aloud to me for fun, running to show me pictures that were especially cute. It was such a hit, we went back to the book fair to buy a second copy to give as a birthday present tonight! 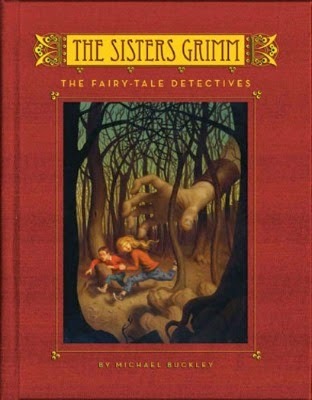 The Sisters Grimm, Book One: The Fairy Tale Detectives by Michael Buckley, illustrated by Peter Ferguson. Amulet Books, 2005. Big Sis is now reading Book Three of Spiderwick Chronicles, here at home. She's loving the series, and when we watched the movie last week, she enjoyed it, too. 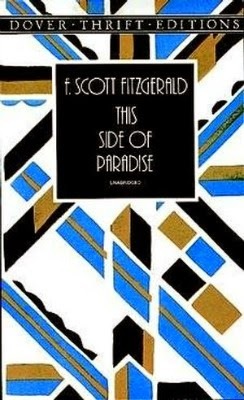 This Side of Paradise by F. Scott Fitzgerald. Originally published by Scribner, 1920. (One of my favorite book covers.) My copy is a cheap Dover Thrift Edition, purchased around 1996. This completed my "five books from five different decades" entry in the library's Adult Winter Reading Program. Oh, Fitzgerald. I love me some Gatsby and many of his short stories, but this one was a chore for me. (So was Tender is the Night, which I read a decade ago.) I wanted to like it much more than I did, especially as someone who loves the time period. 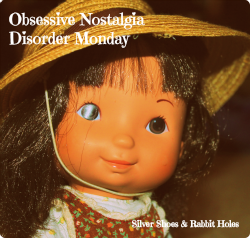 Amory Blaine is an irritating protagonist, some of the book is written as a play, and there are quite a few secondary characters, but you never quite get to know any of them very well. I'm now reading First Frost by Sarah Addison Allen, which is a lot more fun. The girls discovered Good Luck, Charlie on Netflix, which marks the first non-animated or non-preschool Disney Channel show Mr. B and I like! It makes us laugh, and the actors, especially Bridgit Mendler ("Teddy"), are much more realistic than what we're used to from Disney. Little Sis started it. Big Sis joined in. We are now a family of Adventure Time fans. The girls watched the first two seasons on Netflix, over and over again (no cable! ), then we borrowed season 3 and season 4 on DVD from the library. Mr. B got an Amazon gift card for his birthday, and treated us to season 5 on Amazon Instant, because he loves us soooo much. Marceline and the Ice King (Marcy and Simon!) are my favorite characters. I realize I'm 37 years old, but I really would love a pair of Adventure Time Dr. Martens. I would settle for a cool t-shirt, but Cartoon Network seems to think "Women's" only means "Juniors," with a few (very few) fitted adult t-shirts thrown in. I'm way too big for a junior shirt, but I like my shirts to have a flattering cut. Thanks for giving a crap for your grown women fans, Cartoon Network. I guess I don't really need to wear cartoon character apparel, though. Mr. B and I drifted away from Downton Abbey again, but Grantchester is another story. We loooove Grantchester! I'm so bummed that this Sunday's episode is the finale, although there will another season. We've decided that we'll start the second (and last, sigh) season of The Paradise on Netflix next week. We loved the first season, but life was too busy to catch the second season on PBS. The only movie we've seen in the theater is Paddington. What a perfectly charming movie! I adored it, and can't wait for Mr. B to see it, too. Here is the trailer. I'll leave you with my favorite Justin Roberts music video. When the girls were tiny, and this song would come up on a "Move to the Music" segment on Noggin, I would crank it up and sing along. It just makes me happy. so much LOVE here - those pix of the girls are priceless! ADORE! Ok you are a naughty naughty friend for not cluing me into The Paradise earlier - it's SO great - it's a total soap! I love it! I kinda got bored with Larkrise to Candleford. As always, I'm so grateful for these lists of what your girls are watching b/c there's only so much Jessie I can handle around here. I actually love that show and think it's hilarious but it's ALL she wants to watch and I think that's largely b/c she's not sure of what else to watch. Paddington. Oh that dollhouse thing. Oh that tea or hot chocolate pouring train. Oh the mama's clothes. Oh that tree mural! That movie was 99.9% perfect! OMG I want to read The Sisters Grimm right now!! I loved the video you feature too - this series seems to be right up my alley. 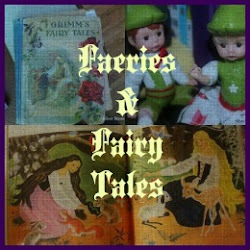 Your picture books look so cook and i didnt know that Pooh story either. I really want to see Paddington with my eldest - but we can't really go to the cinema just yet, the baby wouldn't be happy to be without me for two hours. The kitty and mouse are adorable! Sisters playing together are so cute! They crack me up. Big Sis washed her face soon after taking the pictures, but Little Sis stayed a kitty the rest of the day. She even sold Girl Scout cookies with her cat face. I want to read The Sisters Grimm, too. I'll have to remind her to bring it home when she's finished reading it. As soon as Paddington is out on video, I hope you can see it! It's so lovely.